Walter F. Morris, Jr. became a deep expert in the textiles and culture of the Highlands after traveling to Chiapas as a tourist in 1972. 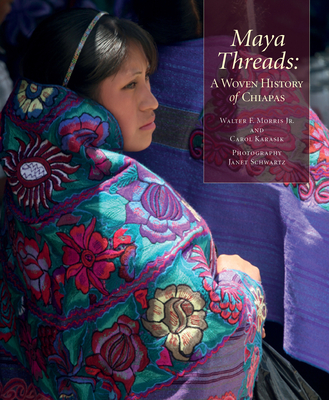 His fluency in Tzotzil and his extensive time in Maya villages have given him unique insights into the history and symbolism of Maya textiles. He is a founder of Sna Jolobil, a weaving collective based in San Cristobal, which both supports weavers and fosters excellence in native textile arts. He received a MacArthur Award in 1983 for his work in textile symbology in Chiapas. Carol Karasik is a writer and editor who has been studying ancient astronomical alignments at Palenque. She is the author of The Drum Wars: A Modern Maya Story and The Turquoise Trail. Janet Schwartz is a native New Yorker who came to Chiapas in 1978 on a Fulbright Scholarship to study the Bonampak murals. She has gone on to become a clothing designer, a tour guide, and ultimately a journalist/photographer with thousands of bylines to her credit. They all live in San Cristobal, Chiapas (Mexico)."